Livvi’s Place is the result of a partnership between Bega Valley Shire Council, national charity, Touched by Olivia Foundation, local organisations and the NSW Government. The partnership came together to create an inclusive play space in the Shire that invites people to play side by side, regardless of their ability. 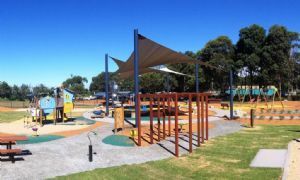 Manager, Leisure and Recreation, John Grady said that developing the play space involved public consultations and the end result is an improved space with play equipment designed to engage the senses. “This is a great example of Council, the community and experts in the field of accessible play coming together to provide a valuable local asset,” he said. The official opening will take place at 11:30am on Friday 15 April at the play space. Photograph: Livvi’s Place at Ford Park in Merimbula is complete.